“Dad can’t play with me anymore,” the son of a Parker Law Firm client shared. His father, injured in a serious car crash, was facing an uphill battle to recover, one that might result in him never returning to full strength. Physically, emotionally and mentally – he was struggling to get back to normal. While the father was the only occupant in the vehicle at the time of the crash, the entire family was reeling from the experience. Sadly, this is not a unique situation. 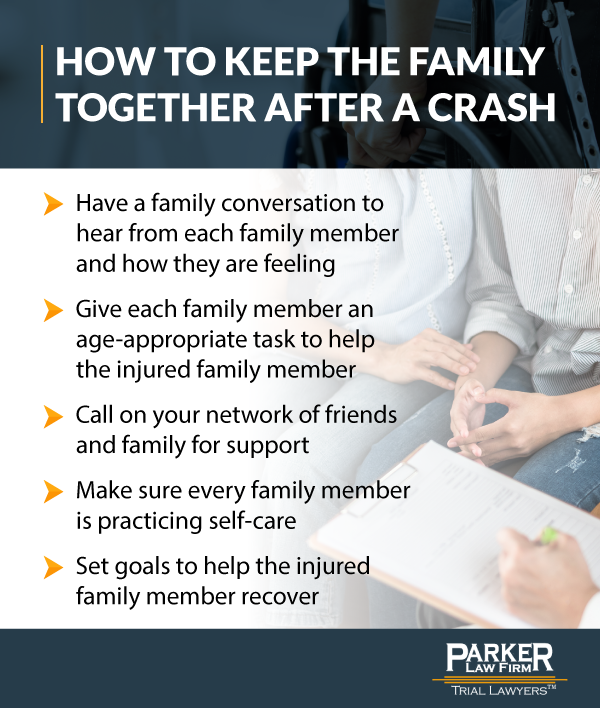 When someone in a family is severely hurt in a crash or accident, the entire family can often feel the impact. The person physically in the crash is hurt and confused. The person taking care of the injured loved one is stressed and emotional, possibly feeling more irritable or simply smiling less. The kids may or may not know all the details, but they are smart. They know something is going on, and they feel the changes in their mom and dad deeply. Physical injuries are the most noticeable, often requiring doctor’s visit, therapy, and reduced activities, but this is not the only type of injury caused by a truck or car crash. Consider the emotional and mental drain on the family. If a mother is caring for a family member who is the victim of a crash, more of her time must go to helping that person heal. And, as all mothers know, there is only so much time in a day, so naturally, her attention is pulled from other activities, such as her career or caring for the rest of the family. Disruptions to a familiar routine are quite stressful. Simple things – missing meals, letting laundry stack up, missing family time or being unable to do hobbies the family enjoys – add up to emotional stress on the entire family. Older children may respond by trying to take on more responsibility. Younger children may withdraw or become clingy. Each family will react in a unique way, making each situation as different as the crash that kicked off the changes. Importantly, one of the first steps is to cut yourself and your family some slack. A crash is traumatic. It can be life changing. Reacting to these changes is normal and expected. Consider sitting down and having a family conversation to hear from each family member. Listen to how each person is processing the changes in their lives. How are they feeling? How are anxiety levels? Consider giving each family member an age-appropriate task to help the hurt family member. People of all ages like to feel like they are working to a common goal and helping the person they love. Plus, this prevents recovery and care from falling squarely on one person’s shoulders. Call on your network of friends and family. Let them bring meals and help with chores. Consider making longer-term plans to have their continued assistance. Even removing a little bit of stress can add up significantly over time. Make sure every family member is practicing some type of self-care. Encourage young kids to play outside and older kids to journal or practice simple yoga. Make sure the caregiver is getting out of the house and doing enjoyable activities when possible. And help your injured loved one make personal goals to recover. If anyone demonstrates heightened anxiety and stress from a crash, especially after some time has passed, consider seeking out a therapist or other professional for them to speak to about their emotions. Car crashes are scary and the effects stretch far beyond the physical impact. If you or a family member want to talk about how a personal injury lawyer can reduce your stress and help you receive fair compensation, call Parker Law Firm at 817.440.3888.